Here we go again... this is not Netflix for LNs. A quick search would have helped. @f10 The way the JNC membership works is it lets you read the latest volume that is currently being translated. After a Volume has been fully translated it is compiled into an ebook and sold on all major ebook retailers. After the ebook has been out for a few weeks all the parts for that volume except a preview part are put into the vault. So for Realist Hero it has been licensed for a while so actually all the volumes that been translated and only V7 is left to be released as an ebook. If you feel this is not a system you want to support you can email supoort@j-novel.club explain what happened and seek a refund. JNC’s business model is twofold the subscription for up to date readers, and they also have an ebook model for people who prefer a complied book vs weekly releases. You can always buy the ebooks of Realist Hero (and any other novels you like) to show your support of the work. It is important to know that every month JNC has a catchup titles where 2 series are selected to all be put back up for all subscribers. Relaist Hero already got a turn not to long ago. However if you follow them on twitter they always announce what the new catchup titles for each month are. So you can re sub if you wish when that happens. Members can read the latest pre-publication ('prepub') parts as they are finished being translated for all of our series! How long are pre-pub parts available? Volume X is no longer available? What gives? Also, every month two JNC series have all their pre-pub parts available for members to catch up on. Unfortunately, this month is not Realist's turn. @f10 yea, I recommend getting a refund and buying the ebooks from other retailers such as Kindle, Google Play, iBooks, Kobo, etc. Just know that you won’t get exclusive short stories that J-Novel premium ebooks come with. @legitpancake and each volume of Realist hero comes with like 5+ bonus stories too. something you would not get at other retailers or say the Fan-translation. Pay this much and get this.... That kinda guy... I hate the whole, pay for this and that and oh yeah, if you want extra sauce on your steak please pay more... But remember there might be more fees and/or charges later for an extra spoon OK.... I hate that stuff bro... I'm outies... If I can get a refund that is hahahahaha. @f10 Since you're a "pay this much and get this" kinda guy, I'll give you a summary of the cost. To get all 7 volumes (as a normal member) you're gonna pay: $4.95 + (7 * 7) = $53.95 USD. Both amounts above account only for 1 month of membership. Now compare those amounts with the amount you'd need to pay to buy the books anywhere else (Amazon, Kobo, etc) and see which way is more convenient. Do remember that the epubs you get from this site directly have no DRM and contain also additional content, which for this series is 5+ bonus stories for each volume. The bonus stories are not essential to understand the main story, but to add interesting bits here and there to the characters. If you want to keep things simple and easy, you can forget about all this subscription and premium stuff and just buy the regular eBooks on Amazon. It's what the vast majority of J-Novel Club's customers do. 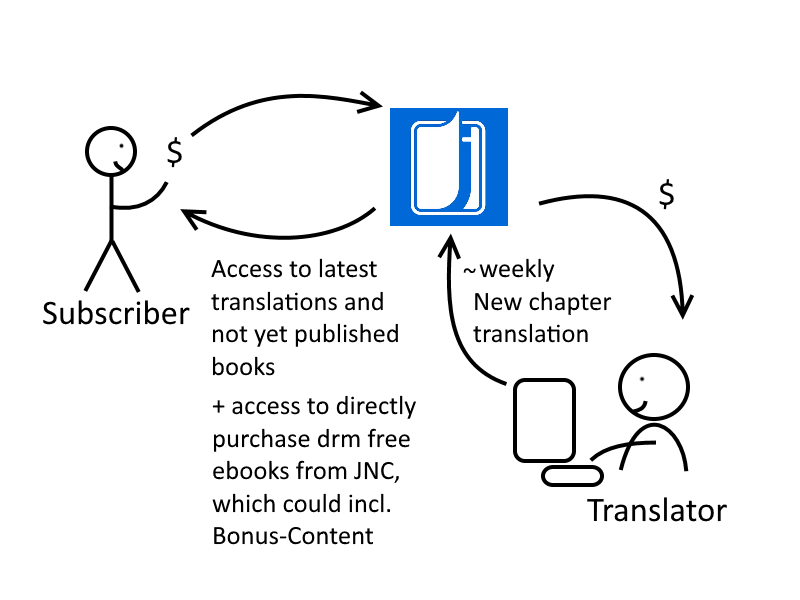 If you feel like you purchased a subscription without understanding what it entailed, you can get a refund by sending an e-mail to support@j-novel.club. This is definitely a situation where they'll be happy to refund you, as it's not entirely uncommon. You don't need a subscription to buy J-Novel Club books from normal retailers like Amazon. @terabyte you forgot that first time members get 2 credits the first month so you would minus 6 bucks. This isn't the first complaint, I really think there should be some sort of big notice page in front for new subscribers as this is getting annoying. Subscribers have access to read pre-pubs until finished LN for that pre-pub is available for purchase. Each month, subscribers may read all the pre-pubs of two random (staff selected?) series regardless of finished LN status. @alocervancouver Might be good to just have it on the subscription page. A line near the top that goes something like: Subscribers have access to read pre-pubs until finished LN is available for purchase. Subscribers have access to read the pre-pubs of up to two random (staff selected?) series each month. Yes it is explained in various places but putting it explicitly on the subscription and how it works pages will help reduce the chance that people will pay based on a misunderstanding of what they will get. It is clear from the number of confused subscribers who are confused that the sufficient notices are insufficient. Simply explaining people get access to prepubs is not enough, it needs to say that for older volumes you need to either buy the book or wait for a catch up. ... Wouldn't that mean it would (in theory) be possible for someone to keep making new accounts so that they get 2 credits for 11 USD? Since it is DRM free? Yeah, I didn't have as much a problem when I subscribed only because I read the FAQ and debated for 3 weeks before jumping in. Saying you have a pre-release access does not make it explicit that you lose access when it is no longer a pre-pub. I just recently became member a few months ago, I could be misremembering but I'm pretty sure I got only 1 credit.